This sultry, spicy dish of cauliflower and potatoes is lightly cooked allowing the vegetables to still have great structure. Done in about 30 minutes it's a quick flavorful addition to any meal. 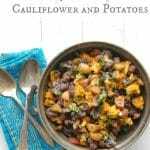 If colorful cauliflower and potates are not available, make the recipe with traditional versions (it will still be great)! In a small bowl mix spices together (turmeric, hot paprika, garam masala, ground cumin and cayenne). Set aside. In a bowl mix together diced garlic, diced ginger and ½ teaspoon oil. Alternatively you may place all three ingredients in a small chopped to both dice and mix the ingredients. In a large heavy skillet over medium high heat combine the cumin seeds and 1 ½ teaspoon garlic-ginger mixture. Sautee until seeds begin to brown approximately 3-4 minutes. Add 1 tablespoon oil and spice mixture to the skillet. Allow spices to heat, stirring occasionally for about two minutes. Add the potatoes, ½ cup water, stir to coat potatoes, cover and simmer over medium heat for 10 minutes. Add the cauliflower, ½ cup water, stir to coat and cook an additional 5-10 minutes. Check for doneness and serve hot. If colored cauliflower is not available, white cauliflower may be substituted.